As the UK's big chill shows no sign of ending, people appear to be seeking to raise the temperature with a bit of online romance. With millions of Britons unable to make it into work because of the snow and ice, one of the unforeseen effects has been a reported surge in the number of people exploring website dating agencies. Stuck at home and bored with daytime television, singletons are seemingly turning their attention to finding a new partner via their laptop, with two of the UK's largest online dating sites both reporting a big increase in traffic over the past two days. 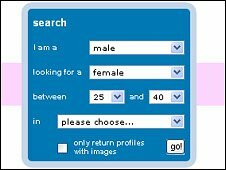 Mysinglefriend.com says visitors to its website soared by 55% on Tuesday alone, with its busiest time coming at 1500 rather than the traditional 2200. Meanwhile rival site Singles365.com says its visitor numbers grew 27% across Tuesday and Wednesday compared with a year ago. "January is our busiest month anyway, as many single people make it their new year's resolution to find a partner," says Singles365.com spokeswoman Katie Mowe. "However, the increase in traffic over the past two days has been very unusual, as typically they are quiet days for us - we are usually busiest at weekends. "We can only put this down to the bad weather meaning more people are staying at home. We saw a similar picture when we had snow last year, but obviously the weather is a lot worse at present so the increase has been much more marked." Sarah Beeny, founder of Mysinglefriend.com, says the snow was "proving to be an icebreaker for singles out there". "January has always been our busiest month, but this surge in traffic is unprecedented." The big increase in people using dating websites comes at a time when the industry is already booming. According to a study by market research group Forrester Research, the number of Britons paying to use online dating agencies is set to grow from 2.6 million people in 2006 to six million by 2012, creating revenues of around £368m. This vast increase has come as more adults are computer literate, the old stigma attached to joining dating agencies has dissipated, and the ability to join an agency via a laptop makes people more comfortable and confident to take the plunge. However, it is not just traditional dating websites that have reported a big increase in business over the past few days. IllicitEncounters.com - a website which provides a platform for married people to conduct affairs - says it gained a record number of new members on Wednesday, with the majority coming from areas of the country worst hit by the extreme weather, including Hampshire, Berkshire, and the wider West Country. The firm says that over the past six days as a whole, it gained 2,567 new members, 37% more than usual, and as a result has needed to take on additional staff to cope with the rush. "In light of these figures, I'd be interested to see how much work those working from home have actually done," said spokeswoman Sara Hartley. But with the bad weather set to continue into next week, many people who have found a prospective new partner via a dating website may have to wait sometime before they can actually meet up for their first date.